Like William Hull, James Henry Lane could be considered as much or more of a military man than a politician. Though he had considerably more political experience than Hull, Lane nevertheless spent much of his time in the field. Ultimately, it was a mix of both political and military issues that led to Lane's downfall. Lane was born in Lawrenceburg, Indiana, in 1814. After attending school and studying law, he was admitted to the bar in 1840 and opened up a practice in his hometown. While there, he became a member of the city council and speaker of the Indiana house of representatives. Six years after opening his practice, Lane left to join the Third Indiana Volunteers. Ultimately, he became a colonel and served in the Mexican War, leading a brigade at the Battle of Buena Vista. Upon returning home, Lane raised the Fifth Indiana Volunteers and served as Lieutenant Governor from 1849 to 1853. Lane left this position after being elected as a Democrat to the House of Representatives in 1852. He served one term, during which his most noted vote was one in favor of the Kansas-Nebraska Bill and the repeal of the Missouri Compromise, an act that led to the "bleeding Kansas" struggles between pro- and anti-slavery settlers in the territory. Not one to shy away from trouble, Lane moved to the Kansas Territory after his term in the House and joined the anti-slavery "free state" faction. In 1855, Lane became the chairman of the executive committee of the Topeka constitutional convention, which formed the first state government. He was also elected major-general of the Free State Troops, and organized the defense of Lawrence during the conflict in late 1855 known as the "Wakarusa War." The key feature of the defense was a network of rifle pits throughout the settlement's streets, ensuring that any attacking pro-slavery army would pay a high price. In a speech after Lawrence's successful defense from Missouri raiders, Lane declared, "That beloved Union, for the safety of which we trembled, will not again, we trust, be imperiled by a foreign force from a sister state invading our Territory. They must and will see the impropriety and injustice of meddling in our affairs until they become our fellow citizens." Lane was known for such speeches in his efforts to encourage anti-slavery settlers to come to Kansas and in his general denunciation of slavery. In an 1856 speech, Lane blamed Franklin Pierce for the bloodshed, since the territory had been rejected for statehood, and arraigned the President as a murderer. The accusation referred to the government's decision that year to not recognize a memorial presented to Congress requesting statehood. Senator Stephen A. Douglas of Illinois accused Lane of perpetrating fraud, since the memorial was plagued with added sentences and several signatures that appeared to be in the same handwriting. An incensed Lane challenged Douglas to a duel, but Douglas refused to accept, saying Lane was not a Senator and therefore not his equal. The rebuke was especially cutting because the Topeka government had appointed Lane to sit in the Senate if statehood was granted. 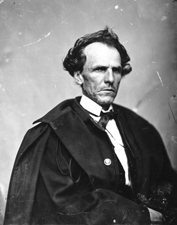 According to John Speer, a compatriot and biographer of Lane, Douglas and Lane eventually became friends due to the approaching Civil War, and Lane mourned Douglas when he died a few months after the conflict began. Lane continued his activities against pro-slavery men in Kansas, earning him the nickname "The Grim Chieftain." When raiders sacked Lawrence in May of 1856, Lane gathered troops from Iowa and Nebraska and entered Kansas to bolster the anti-slavery forces and drive out raiders. During the same month, Lane was indicted for high treason. The New York Times, in Lane's obituary, reported that Douglas County handed down the indictment for Lane's support for the Topeka government, while historian Donald L. Gilmore says the indictment was handed down by a U.S. district court chief justice who charged Lane and a number of other anti-slavery leaders with resisting territorial laws. The indictment led Lane to keep out of sight more than usual, but by the next year he was back on the scene, assisting with efforts to remove raiders from Bourbon and Lion counties. He served as president of the Leavenworth constitutional convention, and was elected major-general of the Kansas troops by the territorial legislature. Lane also corresponded with John Brown during 1857, appointing him a brigadier-general and encouraging him to come to the territory to fight. Brown declined, as he was making preparations for his famed 1859 raid against Harper's Ferry in Virginia. Lane's first serious trouble came in June of 1858, when he shot and killed fellow free state leader Gaius Jenkins as Jenkins came onto land that both men claimed in order to get water from a well. According to Lane's account, Jenkins was accompanied by three other armed men, and he did not open fire himself until three shots had been leveled at him, including one that struck him in the knee. Lane was charged with homicide, but ultimately released on the grounds of self-defense. The incident haunted Lane for at least another year, when a public resolution called him a coward and murderer and said the incident "adds one more infamous page to a life of treason, stratagem, and spoils." In a response published in the Lawrence Republican in March of 1859, Lane declared that he had not expected to kill Jenkins. "It is true that Mr. Jenkins fell by my hand," he wrote. "But no one has more deeply felt or grievously mourned that misfortune than myself." After Kansas was admitted to the Union as a state in early 1861, the legislature elected Lane to the U.S. Senate with 55 votes, a slight majority over Samuel C. Pomeroy, the other man appointed. By this time, Lane had fallen in with the Radical Republicans, who not only opposed slavery but supported civil rights for African-Americans. He had also fallen on poor times. Speer said that when Lane was elected, he was so poor that he "was refused credit for a loaf of bread in Lawrence." With the Civil War underway, one of Lane's most notable actions was commanding the Frontier Guard. Made up of Kansas troops, the Guard was raised for the defense of Washington, D.C. in the early part of the war. They were even camped in the East Room of the White House for a time, according to the New York Tribune. Lane also sent the men on a few offensive actions, including an attempt to capture Confederate general Robert E. Lee. While this failed, they did manage to capture the first rebel flag of the war from the homestead of a secessionist. In June of 1861, President Abraham Lincoln nominated Lane to be brigadier-general of the volunteers. Lane accepted, and for four months commanded the Kansas Brigade, made up of three volunteer units. Following the retreat of Union troops at Wilson's Creek and threats of further violence by pro-slavery raiders, Lane gathered troops and fought skirmishes at Dry Wood and Papinsville. He then led the men on to sack Osceola, Missouri. Lane's military activities back in the West weren't exactly conducive to his duties as a U.S. Senator. Following his nomination to be brigadier-general, the Judiciary Committee determined that he "virtually resigned his seat." Governor Charles Robinson appointed Frederick P. Stanton, a former governor of the Kansas Territory, to fill the vacancy. Robinson was not very fond of Lane, resentful of his influence and troop-raising activities, which were not strictly within his authority. Though the Senate considered the question of whether Lane was "not entitled to a seat in this body," the seat remained Lane's when the question was amended in January of 1862 to remove the word "not" and accepted. Though Lane's hope was to raise an expedition of Kansas troops, Native Americans, cavalry, and artillery to invade the southwestern portion of Confederacy, the idea was abandoned due to impracticality. Nevertheless, Lane continued to see action in the West during the Civil War. In July of 1862, he was named commissioner to superintend the recruitment of volunteers. One noted result of Lane's recruiting efforts was the First Kansas Colored Volunteers, the first black regiment created in the Union army. He sent agents throughout the Union to raise troops, but ultimately the War Department asked that it be put to a stop after receiving complaints that it was hindering efforts to recruit white men. Undeterred, Lane continued to muster troops without federal or state backing. He even hired black recruiting agents, promising pay equal to their white counterparts. Eventually, the regiment received federal authorization. Already an enemy of pro-slavery forces in Kansas, Lane's activities and declarations (including one that overthrowing slavery would destroy the Confederacy) did nothing to endear him to them. One goal of William Quantrill's 1863 raid on Lawrence was to find and kill Lane. Though his house was one of some 185 buildings torched, Lane was not among the approximately 150 casualties of the massacre. He had managed to escape through a window and nearby cornfield. Enraged by the attack, he called for western Missouri to be converted into "a desert waste." He also pressured a local brigadier-general to pass an order calling for the inhabitants in four Missouri counties to evacuate if they were not loyal to the Union and relocate to a military post if they were. In October of 1864, Lane was named volunteer aide-de-camp when martial law was proclaimed in Kansas. Lane managed to find some time in these adventures to do work in the Senate. He chaired the Committee on Agriculture during 1864, and also helped to get the Union Pacific Railroad moved three miles to access Lawrence and Topeka. When the railroad requested $300,000 to counteract the loss of funds the diversion would cause, Lane responded, "Before you get a dollar out of that burned and murdered town, you will take up every stump, and every old log you have buried in your grade to save money, and stone-ballast every rod to Lawrence; and even then, when you get your first subsidies, let Jim Lane know!" When the war concluded, the Chicago Tribune published an account suggesting that a U.S. Senator was personally receiving $20,000 in a deal involving Indian Bureau transactions and military contracts. Though the newspaper didn't name anyone, the Boston Commonwealth suggested it could be Lane. He denied any involvement in such a deal, and was supported by the Senators from Indiana, who declared him innocent after looking the matter over. Though he was exonerated on the accusations, the incident only further stressed Lane, who had been returned to the Senate in 1865. He lost favor among the Radical Republicans when he opted to support President Andrew Johnson's watered-down approach to the Reconstruction, including Johnson's opposition to the Freedmen's Bureau and veto of the Civil Rights Bill. In July of 1866, Lane visited his brother-in-law, a Captain McCall, and the two rode out from Fort Leavenworth. When McCall opened the carriage door for him at a stop, Lane stepped out, said, "Goodbye, Mac," and shot himself in the head. He died 10 days later. In pondering the incident, contemporary sources often turned to mental illness as a way to explain the suicide. Speer, declaring Lane overworked and deranged, said, "There is nothing strange about such a man becoming insane." The New York Times obituary stated, "Mr. Lane's present term in the Senate was unmarked by ought that was peculiar or out of the ordinary routine. He was eminently social, kind-hearted, and just faithful ever to his friends, relentless ever to his foes." Initially referring to his condition as "temporary insanity," the newspaper declared four days later that a doctor had determined that the suicide was "attributed solely to mental aberration, induced by extreme prostration and derangement of the nervous system, and aggravated by anxiety."